In Western North Carolina counties, such as Buncombe, the opioid overdose rate has spiked and is at an unsettling rate. It has overwhelmed social workers, law enforcement, and multiple other local civilians affected by the epidemic. In the first eight months of the year there were 230 opioid overdose cases in our county, with dozens resulting in death. Synthetic opioids are a drug that relieve pain as well as produce euphoria. Euphoria is a feeling or state of intense excitement and happiness. Opioids can be used safely when taken for a short amount of time when prescribed by a doctor, but because of the euphoria that they produce they can easily be abused. Even when opioids are used properly and prescribed by a doctor, one can become dependent on the drug and can lead to addiction, overdose, and potentially death. It is estimated that between 26.4 million and 36 million people abuse opioids worldwide. It's estimated 2.1 million people in the United States suffer from substance use disorders related to prescription opioid pain relievers. In Buncombe County opioid abuse is most common in 25 to 34 year old white adults. Opioids have 230 deaths to its name in the past 8 months in Buncombe County alone. A recent survey conducted at Asheville Middle School shows that not just authorities, but everyone, thinks that opioids are a problem in Buncombe County. Recently in Buncombe, a meeting was held to discuss the epidemic. Representatives for multiple parties affected by the epidemic told Attorney General Josh Stein about the problem and what they think needs to be done. Stein also met with multiple groups of current and previous addicts of the drugs, “Ive met addicts who would have sold their mothers for their next fix.” said Stein. Children and infants being tested for drugs in their system are being found to have methamphetamine, ecstasy, and multiple other different types of opioids mixed in. Ninety percent of children coming in to be tested are testing positive. Ten Buncombe County school officers were trained to reverse overdoses recently in order to help prevent death by overdose in middle and high schools in the area. They were trained on how to administer overdose reversal kits, also known as Narcan kits. They will also know be provided with naloxone nasal spray, which can almost instantly reverse an overdose. It is clear to many, if not all, that opioids are a serious problem in the US and Buncombe County. Many citizens are actively working to help with the epidemic and try and slow the death by overdose rate in Buncombe County. MOD Pizza, a pizza place known for their super fast, super good pizza. MOD is located on Merrimon Avenue, in Asheville, NC, and is known for its delicious pizza. MOD is a relatively new pizza place, opening slightly over a year ago, and has stunned the public with its wonderful pizza. Once you walk in to MOD you will have two choices of pizza, a mod or a mini. Both options have 4 slices, the only difference being the size. Once you walk in you turn right, then go through the buffet-like order place, where you get to order your pizza. The first time I went into MOD I had a feeling that reminded me of a Subway type restaurant, with a bar that you walk down choosing which items you want on your pizza. MOD also has an online order option, which when you go on their website you can order pizza, salad, beverages, sides, milkshakes, or desserts. MOD claims that in only minutes, they can prepare an artisan-style pizza or salad, but can they really do it in minutes? I have eaten at MOD many times and most of the time it takes about 5 minutes to order and have your food ready. However, my most recent trip wasn't as fast. I ordered a mini pepperoni pizza, and it wasn't ready for around half an hour which led me to think that there was an error while making it, for example a shortage of ingredients. Overall though, they have fast and friendly service that keeps you coming back! For more information visit MOD pizza's website. Ever slept alongside a snake? According to a report from WLOS, The Asheville Police Department posted to Facebook on Monday that officers were called to the hotel when a boa constrictor was found in a bed. The police did not name the hotel yet, but the Boa actually had a name, Chuck. He was left by a guest, Neil Miller. He stated that he was visiting a friend when he "accidentally" left Chuck, his 3-year old boa constrictor, in the room. "I set him down for two minutes and forgot about him, walked out," Neil said. This Asheville hotel is currently making a new pet rule due to the incident. The housekeeper who came across the Boa halfway under the sheets, says “it was the most terrifying yet hilarious thing I have ever come across when cleaning hotel rooms.” The owner of the snake, Neil Miller, said when he realized he had forgotten Chuck, it felt as if he lost his son. Don't leave your pets in hotels please! Due to all of the rain that has happened yesterday, lots of areas have been affected by flooding and other issues. 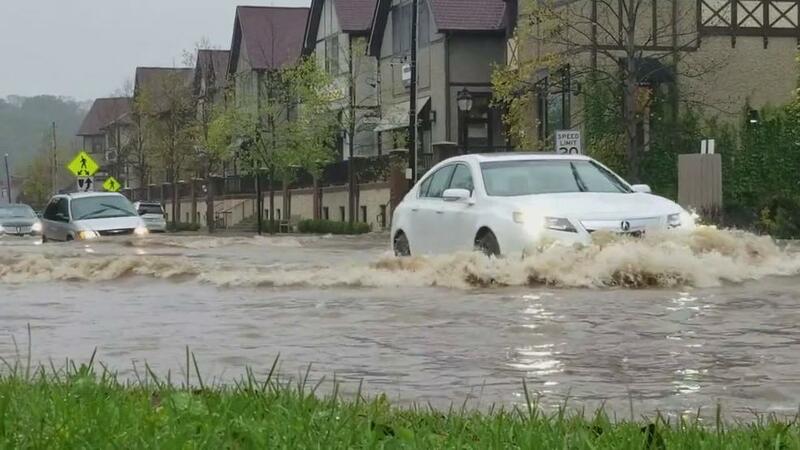 The Biltmore Village has been severely affected, with lots of roads VERY flooded. Lots of cars have to drive through this water but, at least people can still move through the water. There were 4 inches of rain that fell since yesterday. Some roads in that area were underwater this afternoon, making for dramatic social media videos as lots of vehicles tried to make the trek across flooded roads. That means people will have a hard time getting to work and walking through the water. It was so high that it went up to some adult's waists. Stay safe out there! Looking for a place to stay in Montford? The Lion and the Rose is an awesome place to go if you are ever in need of a stay-cation in Asheville, NC. Each room has it’s own unique personality! There is also a full breakfast with coffee outside your room by 6:45 am in the morning for you coffee lovers out there!! Outside, there is also a fire pit with chairs to sit down and relax and talk with your friends! Lisa Merritt own’s the Lion and The Rose Bed and Breakfast. She works with her daughter, Madelyn Silcox, and together they make an awesome team. There are also 2 royal pups there (Cooper and Luna), who are very hard working dogs that keep the guests happy during their stay. Luna would love to cuddle up with you at the end of the day! Here is some things Lisa said about working at the inn Lion and the Rose, "working at the Inn is my favorite job that I've ever had because it's everything I enjoy doing: entertaining and cooking for people. It's a fun job because I meet people from all over the world. My days are all pretty much the same, I wake up at 6:30 and prepare breakfast for 10-12 people to eat at 9:00AM each morning, then I clean up and do grocery shopping. Guests check in at 3:00 PM, so I check them in and get them settled. I have some time in the evenings to myself then my day starts right up again the next morning. My favorite part is the breakfast. I love coming up with new recipes to cook for guests each morning. Fall is our busiest season and I think it's one of the most beautiful too. Plus, Halloween in Montford is really fun! I change the menu up all the time depending on the season and who is staying with us. I never want guests to have the same meal twice, so I alternate between a sweet dish and a savory dish. I make pancakes pretty often, in the fall I'll make pumpkin spice and in the summer I like to do lemon ricotta. I make breakfast chimichangas and Eggs Benedict on some of the savory days. Because planning and creating the breakfasts is my favorite part, I like to change things up a lot. I've always loved cooking and entertaining, so the inn is the perfect job because I live where I work. I asked my daughter, Madelyn, to come and help me and it's been the best decision! We are a great team together! The Inn is kid friendly also!!" Roller derby is a fast moving contact sport that requires speed, strategy, and thick skin. The game is played with 2 teams of 5 players skating in the same direction on a round track. Both teams have 1 jammer who skates behind the wall and tries to break through the opposing wall. Each player that they make a lap around counts as one point. The team tries their best to help their jammer get through the opposing wall while still trying to block the other team's jammer. The team pictured is called the Blue Ridge Roller girls, a local Roller Derby team in the Asheville area. I have been playing on the Mad Divas Junior Roller Derby Team for 6 months, although I’ve been playing derby for around a year and a half. I play Roller Derby to relieve stress and get exercise. We practice every Wednesday from 4:30 to 7:00. If you're interested in checking out a game or playing, you can go on their website to find games and more information. Asheville Ghost Stories: Are you a believer? A room at the Grove Park Inn. ​Are Ghost Real? Some people say that they have seen or heard ghosts, but some say that it's just in their head and that ghosts aren't real. A lot of ghost stories take place here in Asheville. I did some research here, and found that the most famous ghost story in Asheville is called “Brown Mountain Lights”. The story says that there are some random moving lights every night along the ridge and some say they are spirits of Cherokee wives and mothers. The next story is called “Katherine's bed and breakfast”. The story says the bed and breakfast is haunted by Grace, the former owner's grandmother she walks around the B and B.
has been reported to have paranormal activity. From lights turning on and off by themselves to a spectral voice telling security guards to "get out". So, what do you think? Are ghosts real?